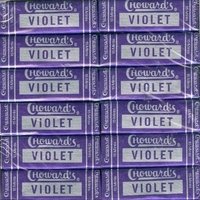 C howard's Violet mints. A square candy mint with a unique floral flavor and scent unlike any other mint. They are remembered by many as the square mint in the purple foil wrapper. 24 packs each with 15 mints. Violet mints have been around since the early 1930's and still have a following today. If you enjoy the flavor of Choward's Violet Mints you can also get violet's scented gum.